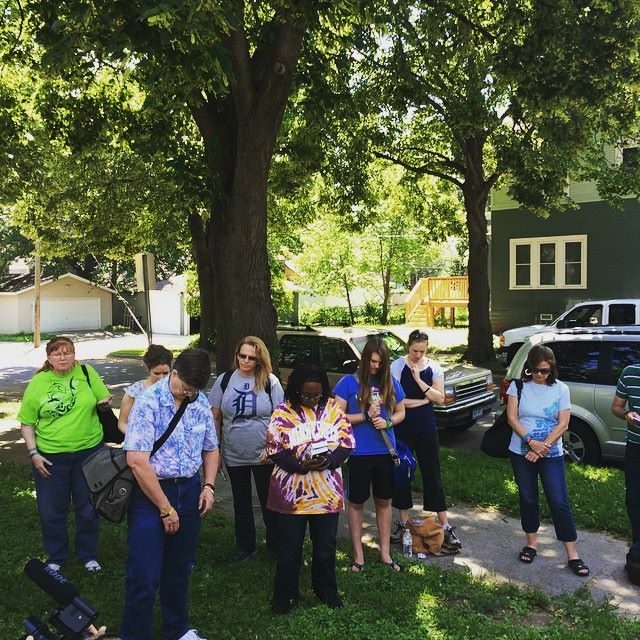 Here’s todays update on Love Minneapolis, a 24 hour/7 day experiment combining 24 hours of worship & intercession with 24 hours of evangelism throughout Minneapolis. Dre works at a shop on the street selling ‘clothes’. I’m not actually sure what they sell out of this place, but I can’t imagine they survive off their 2 racks of t-shirts and misc rags. We talked philosophical for a long time: “I know there’s a Creator, but who’s to say this God is true or the other. How can I know God is real? These people out here are real, all trying to make their rent, but I can’t sit down and talk to God and touch Him…What’s the point of going to church? These people dress up, then go home and do their own thing.” He had a lot of great questions and deep thoughts. I shared my testimony: how I grew up in religion and it was powerless to save me. I knew about God, but had no concept that He was actually wanting to be involved in my life. The words of the Bible really made little sense to me, and I was powerless to do right. We aren’t preaching religion, but there is a God and there is a way to get to know Him. There is no way any of this earth came into existence without a Creator. It is way too complex, and even our bodies display a Creating hand. There was a Jesus. It’s a historical fact. So, if there is a God and there was a Jesus, we have to take time to consider what that would mean for our lives. What did Jesus say? How is the Bible reliable? Can I trust what the Bible says about Jesus? I ended my testimony by sharing about how I met the Holy Spirit, and how He changed everything for me. The words of the Bible came alive and I experienced His joy and peace. It’s true, we can’t see God, but we can see the effects of God and we can feel Him just like we can feel other things like love or hate. True peace with God comes through surrender to Him and following the path that Jesus laid out: “I am the Way, the Truth, and the Life”. He allowed us to pray with him, and he signed up for a discipleship tool called the New Believer Survival Kit. He’s not ready to walk with Christ yet, but I believe he is on his way. Annie was sitting on her roof smoking a cigarette. We complemented her on her view and chatted about the nice weather. I noticed a rosary and cross on her wrist and neck, so we began chatting about religion as well. At one point I asked if we could pray for her about anything. “Do you want me to come down?” she asked. “You don’t have to, I can pray from here,” was my reply. “Oh, I’ll come right down” was her response! She had a lot of pain in her life. Her kids weren’t with her any more, and her mom was on the streets. She’s living in someone else’s basement and was trying to pray, but didn’t know the peace of God. We went through the Gospel message with her, and Annie decided to begin a new relationship with Jesus today. We held hands and prayed together for Christ to come in to her life and begin a new journey. I was able to sign her up for the discipleship tool as well, and we hope to bring her to church on Sunday. Please keep praying for us and these seeds of the Gospel. Our team of 20 touched 90 people today in just 1 afternoon. 5 others also surrendered their life to Christ (4 of them were kids, but I still count them). Prayer and Worship change the atmosphere. Evangelism is partnership with God, and engaging with His heart for the lost. We learn about His heart in intimate prayer and worship, and from that place we go out and Share His Heart with the world around us. Hi Tim can you send or tell me where to get a New Believer Survivor Kit? 651.797.6363 Blessings to you and yours!